I am on the small side for a golden at forty-two pounds, but I am big on personality! I love, love, love, people and not afraid to show it. Although I have some arthritis, I still enjoy walking a mile several times a day with my foster mom and I have more pep in my step now that I am taking a little pain medicine every day. I am the official greeter in the neighborhood and charm everyone I meet. While I was a stray, I learned to protect what I possessed and I’m usually not willing to share my Kongs or deer antler with my fur foster siblings. However, I readily give my humans anything they ask for. I also keep an eye on my food bowl even if it is empty, but I don’t bother the other dogs when they are eating their meals. I don’t need a crate in the house and I never touch things that I shouldn’t when left alone. But, I find it comforting to ride in the confines of one when going sight-seeing in the car. I learned in my past life that the squeaking wheel gets the grease and I often try barking at my mom and dad when I want something like my dinner or some attention. I’ve noticed lately that they have begun to ignore my outbursts and I am beginning to realize that tactic doesn’t work here. I will also enthusiastically join in a chorus of barks with my siblings even if I don’t know the reason for their vocalization! Coming from Puerto Rico, my native language is Spanish. Foster mom is my English tutor and tells me how intelligent I am. She says I am now bilingual because I now understand basic commands and phrases in my new vernacular. Of course, the universal language of “hugs” was easy to master. The young four legged whippersnappers I live with do lots of running and zoomies which I join in for short bursts, but I am happiest relaxing close to my humans, getting brushed, petted and attempting to be a lap dog. My wish is to find a special family who is looking for a docile companion who is content to relax at their feet, cuddle on the couch, take short walks and doesn’t need the constant scrutiny that a youngster requires. 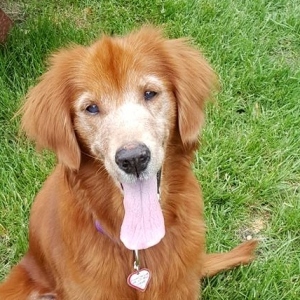 I am a spunky senior who will greet you at the door with wagging tail and lips raised in a huge golden smile. What a wonderful way to be welcomed home!